Designing a tortoise habitat starts with determining the location for the enclosure, its style and your budget. It is important to understand the natural history and necessary husbandry for your particular species of tortoise and to incorporate those requirements into the habitat’s design. Different tortoise species will have slightly differing needs, but all tortoise habitats have the same basic requirements: a thermal gradient, full-spectrum lighting or unfiltered sunlight, a water reservoir, hiding spaces, and enough space to permit exercise and natural behaviors. The habitat will need periodic cleaning and maintenance, and it will need to be secure from predators and sturdy enough to withstand the wear and tear the tortoise dishes out. Some tortoises have characteristics that dictate the type of habitat you must provide. Red-footed tortoises (Chelonoidis [Geochelone] carbonaria) require high humidity to thrive, so keepers in dry regions must keep them indoors. African spurred tortoises (Geochelone sulcata) are very large animals who are simply too big to be kept indoors in most circumstances. If you would like to keep your tortoise outdoors, it must be from a similar -- though not necessarily identical -- habitat as your own. 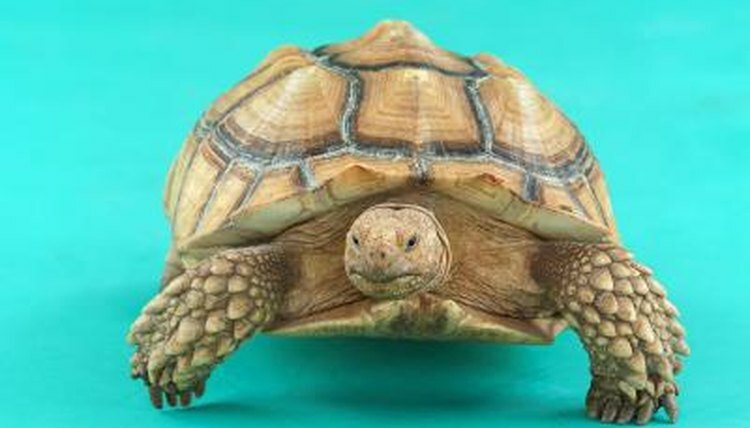 Additionally, give consideration to the behavior and needs of your animal, some tortoises require a deep substrate for tunneling; others require rock piles for climbing and sleeping locations. For tortoise keepers whose regional climates are the same as their pets' natural habitats, outdoor accommodations are a possibility. The primary benefit of outdoor tortoise habitats is access to the sun -- the sun provides the heat and UVB needs for your tortoise. The fresh air is a benefit, too. You can plant edible greenery in the enclosure, and you can devote unlimited space. The downside of an outdoor cage is that a tortoise is more exposed to predators, pathogens and inclement weather. With ingenuity and careful planning, you can include locking tops and climate-controlled retreats to help protect your pet in an outdoors habitat. A 12-inch tortoise needs about 15 square feet of cage space, which is hard to find in commercially manufactured cages. For smaller species, commercial cages are suitable for keepers who don't want to experiment with adapting a stock tank or building a cage from scratch. A highly effective yet cost-effective option is to repurpose a stock tank or prefabricated pond liner into a tortoise habitat by building a frame to support it and beams across it for attaching lighting fixtures.